张伟宏, 廖泽波, 陈仕涛, 邵庆丰, 段福才, 朱丽东, 王天阳. 湖北高分辨率石笋记录的DO18事件特征[J]. 沉积学报, 2018, 36(4): 674-683. ZHANG WeiHong, LIAO ZeBo, CHEN ShiTao, SHAO QingFeng, DUAN FuCai, ZHU LiDong, WANG TianYang. 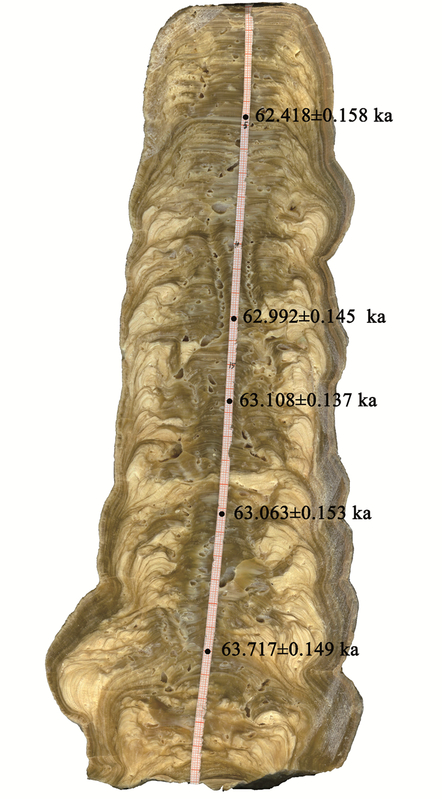 DO18 Event Depicted by a High-resolution Stalagmite Record from Yongxing Cave, Hubei Province[J]. ACTA SEDIMENTOLOGICA SINCA, 2018, 36(4): 674-683. Abstract: It helps further understand and test forcing mechanisms behind millennial-scale events to decipher their regional responses and structures during the periods of large ice sheets. Using 323 stable oxygen isotope ratios and 5 230Th ages of a stalagmite in Yongxing Cave, central China, we reconstruct a detailed history of the East Asian hydrological cycle during the time span surrounding the Dansgaard-Oeschger (DO) 18 event. 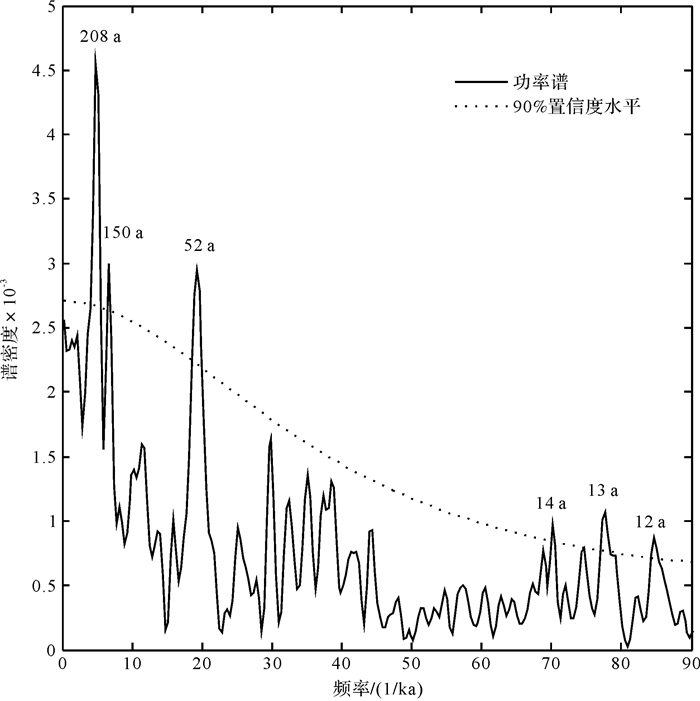 The calcite δ18O profile, together with another two stalagmite records from the same cave, shows a rapid decrease of 1.5‰ at~64.7 ka, confirming the occurrence of DO18 in the East Asian monsoon (EAM) region. The ending limb of DO18 in the EAM regime is characterized by five centennial-scale monsoon enhancing events, and finally culminates at~63.0 ka. Divergent from a rapid temperature increasing followed by a similarly rapid cooling (~60 a) back to stadial environments of the Greenland DO18 event, the DO18 event in the monsoon region exhibits a significant asymmetric feature with a sharp EAM strengthening but then a smoothing, lasting 1 500 a, decrease. Nonetheless, our stalagmite δ18O records mirror, in shape and timing, the variations of Atlantic meridional overturning circulation (AMOC) estimated by the ratio of 231Pa/230Th and recovered from the deep western North Atlantic. This similarity suggests that the AMOC played an important role in regulating the DO18 event in the EAM region. On the other hand, the discrepancy in the pattern of DO18 between the EAM and the North Atlantic climate systems can be attributed to the different regional response to the AMOC change in the high-and low-latitude climate systems. 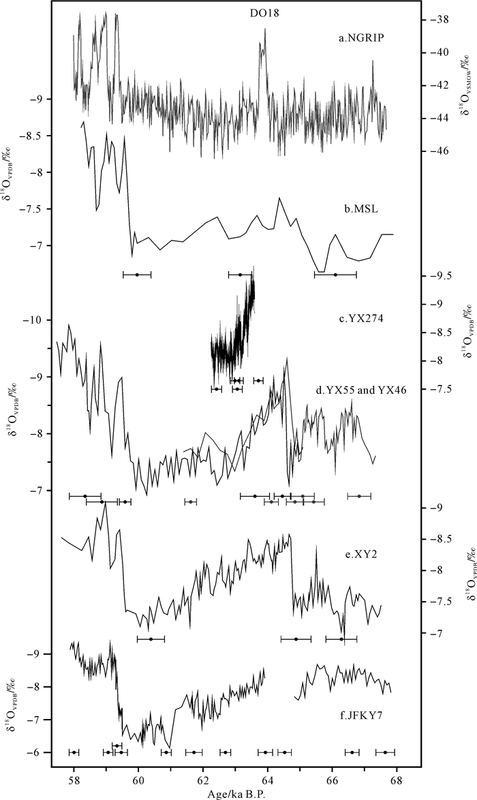 Spectral analysis of the stalagmite δ18O record denotes significant cycles at the 90% confidence level at 208, 150, 52 and 14-12 a, close to the previously reported solar cycles at 207, 149, 57 and 11 a. This consistency of cyclical variabilities between the EASM intensity and solar activity might indicate that solar forcing of centennial-and decadal-scale EASM variation still existed during the MIS4 interval with larger ice volumes. Waelbroeck C, Labeyrie L, Michel E, et al. Sea-level and deep water temperature changes derived from benthic foraminifera isotopic records[J]. Quaternary Science Reviews, 2002, 21(1/2/3): 295-305. Wolff E W, Chappellaz J, Blunier T, et al. 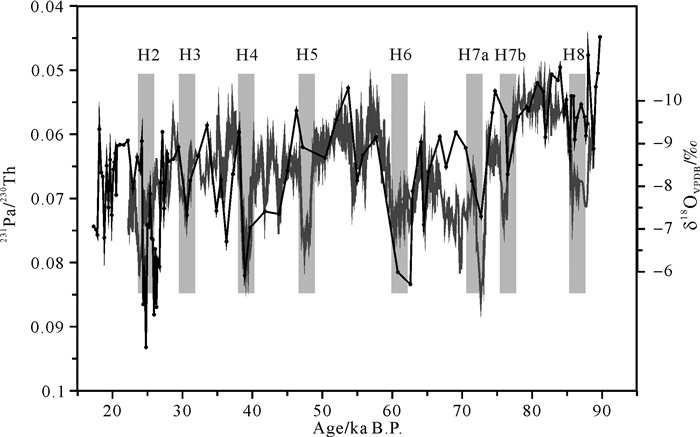 Millennial-scale variability during the last glacial:the ice core record[J]. Quaternary Science Reviews, 2010, 29(21/22): 2828-2838. Xia Z F, Kong X G, Jiang X Y, et al. 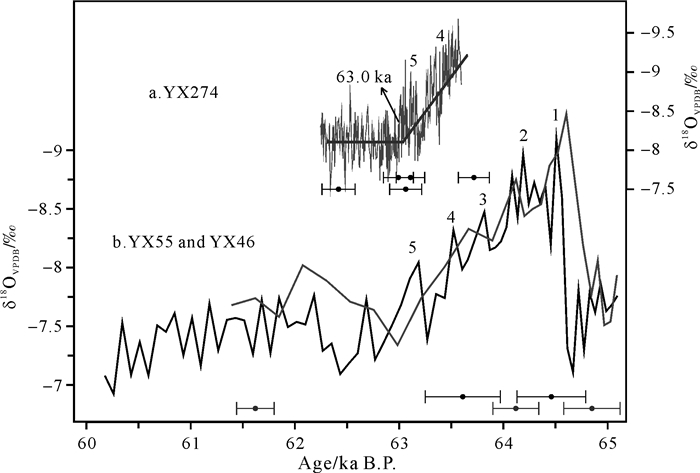 Precise dating of East-Asian-monsoon D/O events during 95-56 ka BP:Based on stalagmite data from Shanbao Cave at Shennongjia, China[J]. Science in China Series D:Earth Sciences, 2007, 50(2): 228-235. Shen C C, Edwards R L, Cheng H, et al. Uranium and thorium isotopic and concentration measurements by magnetic sector inductively coupled plasma mass spectrometry[J]. Chemical Geology, 2002, 185(3/4): 165-178. Scholz D, Hoffmann D L. StalAge:an algorithm designed for construction of speleothem age models[J]. Quaternary Geochronology, 2011, 6(3/4): 369-382. Dayem K E, Molnar P, Battisti D S, et al. 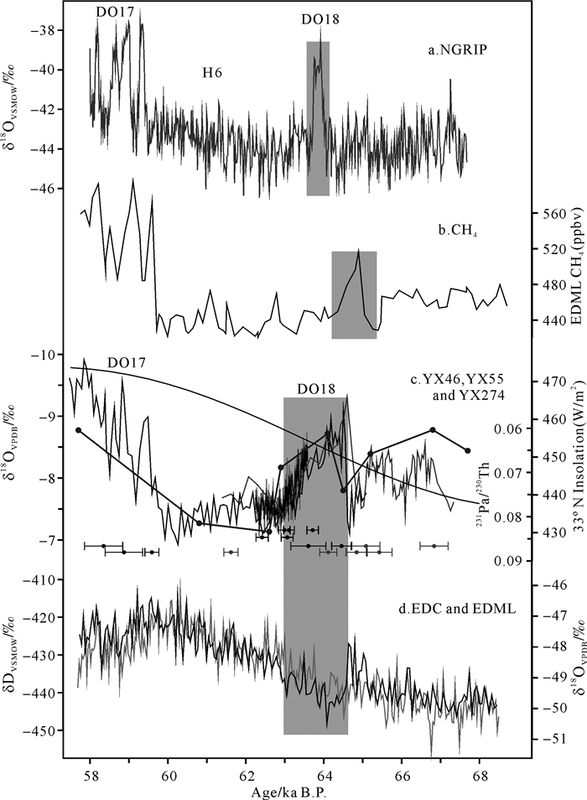 Lessons learned from oxygen isotopes in modern precipitation applied to interpretation of speleothem records of paleoclimate from eastern Asia[J]. Earth and Planetary Science Letters, 2010, 295(1/2): 219-230. Tan M. Circulation effect:response of precipitation δ18O to the ENSO cycle in monsoon regions of China[J]. Climate Dynamics, 2014, 42(3/4): 1067-1077. Tan L C, Cai Y J, Cheng H, et al. Summer monsoon precipitation variations in central China over the past 750 years derived from a high-resolution absolute-dated stalagmite[J]. Palaeogeography, Palaeoclimatology, Palaeoecology, 2009, 280(3/4): 432-439. Mudelsee M. Ramp function regression:a tool for quantifying climate transitions[J]. Computers & Geosciences, 2000, 26(3): 293-307. Denton G H, Alley R B, Comer G C, et al. The role of seasonality in abrupt climate change[J]. Quaternary Science Reviews, 2005, 24(10/11): 1159-1182. Liu D B, Wang Y J, Cheng H, et al. A detailed comparison of Asian Monsoon intensity and Greenland temperature during the Allerød and Younger Dryas events[J]. Earth and Planetary Science Letters, 2008, 272(3/4): 691-697. Levine J G, Wolff E W, Hopcroft P O, et al. Controls on the tropospheric oxidizing capacity during an idealized Dansgaard-Oeschger event, and their implications for the rapid rises in atmospheric methane during the last glacial period[J]. Geophysical Research Letters, 2012, 39(12): L12805. van Huissteden J. Methane emission from northern wetlands in Europe during Oxygen Isotope Stage 3[J]. Quaternary Science Reviews, 2004, 23(18/19): 1989-2005.